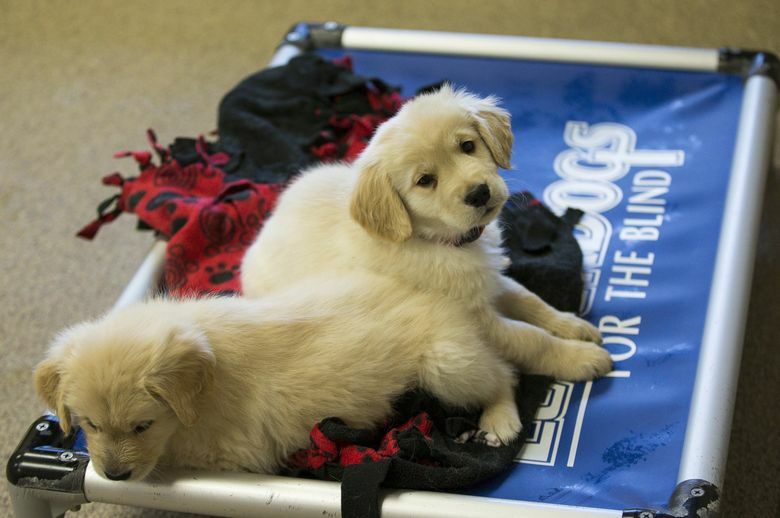 An executive training program at Leader Dogs for the Blind in Rochester Hills, Michigan, uses guide dogs to teach managers how to improve teamwork skills, clarify communication, build trust, do strategic planning, use creative problem solving and ultimately become better bosses. Meet Coco. She’s a 2-year-old yellow Labrador retriever — and she happens to be one of the best trainers of people in the world. Coco is one of about a dozen dogs in the executive-training program at Leader Dogs for the Blind in Rochester Hills, Michigan. The program teaches managers how to improve teamwork skills, clarify communication, build trust, do strategic planning, use creative problem solving and ultimately become better bosses. 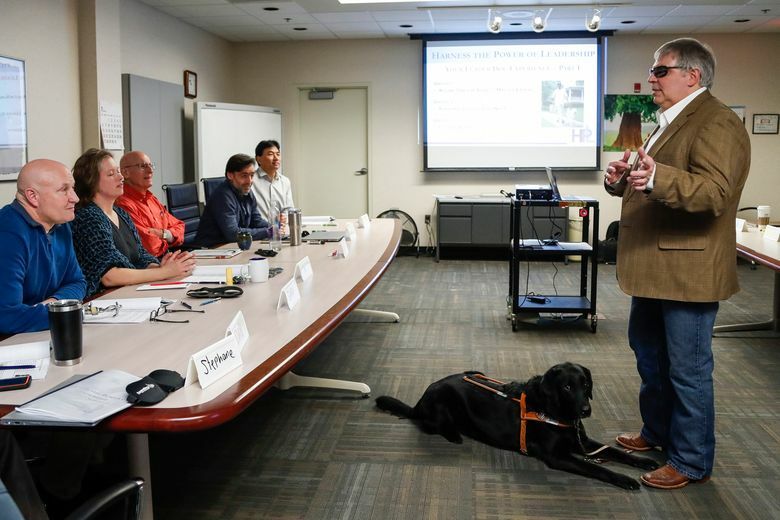 “It’s the best training for people you’ll find,” said Dave Bann, corporate-engagement manager for theLeader Dogs for the Blind program. Dog teaching man might sound as far-fetched as man biting dog. But not to those who have experienced the training course, such as Ginger Auten of Mitsubishi Motors research and development in Ann Arbor, Michigan. “It was amazing,” said Auten, manager of human resources and administration at Mitsubishi, who did the Harness the Power of Leadership training last week. The challenge of overcoming fear, handing over trust and feeling “amazing” for doing it, seems to be a universal reaction from those who do the course. Brauer started using a guide dog in 1944. “He filled me with this level of confidence and gave me the tools to be a guide-dog handler, which are the same tools required to be successful in life,” he said. 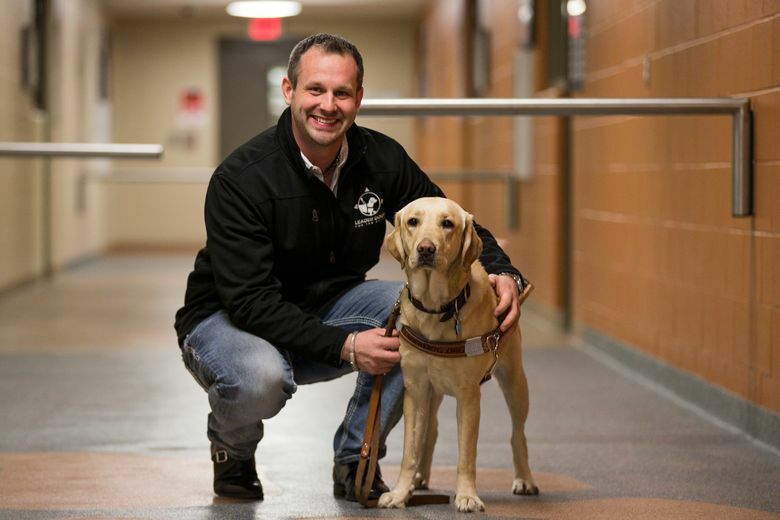 Most important is to demonstrate consistency in the treatment of people around you, Brauer said, using his partnership with his current guide dog, a 5-year-old golden retriever-black Labrador mix named Logan, as an example. It took about a year to write the curriculum for the executive training course, Bann said. The courses are either a half-day or full-day. 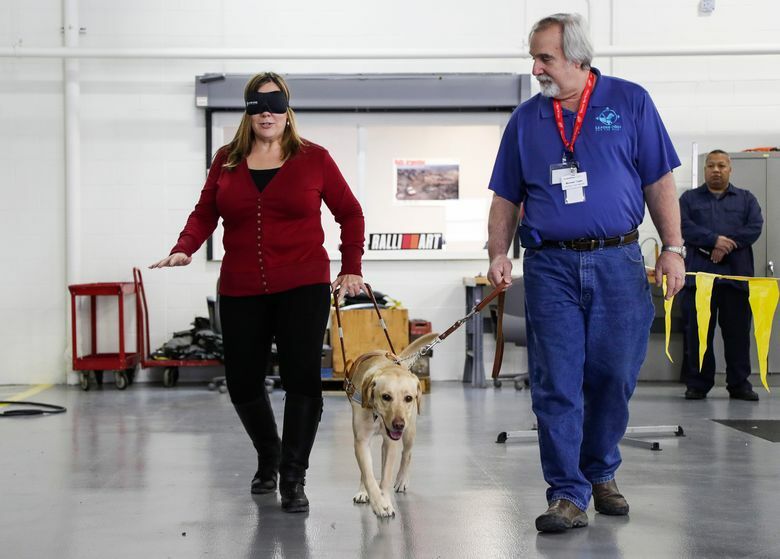 They involve the blindfold walks, a white-cane walk and various team-building activities such as clicker training, in which participants must complete a task based only on cues Bann gives them by using a dog clicker. In short, they become the dog in an exercise designed to teach them how to give and receive instructions through cues. It’s analogous to how different parts of businesses often speak different languages yet have to learn to communicate so they can work together. About two years ago, Bann started aggressively marketing executive training at conferences. He’s done about 20 sessions since Purina in St. Louis first did the course. Daniel Meloni, 56, is senior director of talent development at ProQuest, a technology company in Ann Arbor. He and about a dozen senior managers did the Leader Dogs for the Blind executive training last fall. One team-building activity that involved building a display using different colored blocks has now changed the way Meloni talks to his staff. Training also teaches the power of strategically planning and intelligent disobedience. For example, a person who is blind must plan a walking route and be ready to change course if an obstacle appears. The guide dog must be given leeway to disobey commands when the dog knows best. A dog-handler trainer at the Mitsubishi session told about a woman who was blind and lived in a high-rise apartment building in New York. One day, when the elevator doors opened on her 78th floor lobby, she commanded her guide dog to walk forward. The dog did not budge. Again, she said, “forward.” The dog refused. That’s because the elevator doors had opened to an empty shaft and the dog knew stepping forward would be deadly.